I was so excited about my new vanity from Lowes that I got this year because it had drawers. Unfortunately, my ginormous hair dryer with diffuser wouldn’t fit into the drawers. So I ended up keeping it in the cabinet vanity by itself. 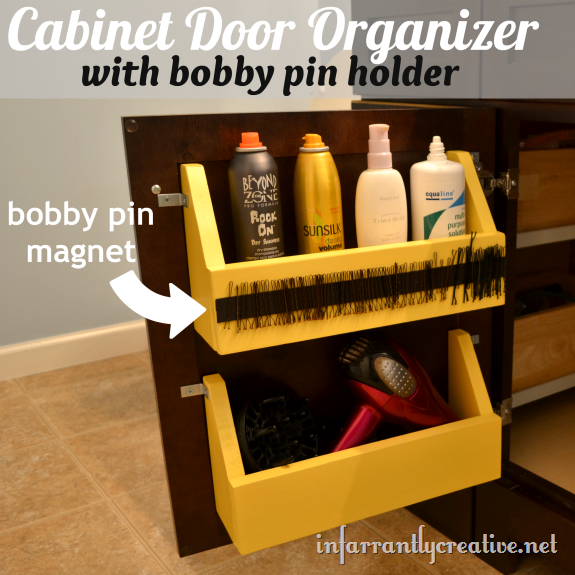 When I saw the cabinet door organizer idea on Better Homes & Gardens I put it on my to do list so that my hair dryer would have a dedicated home. 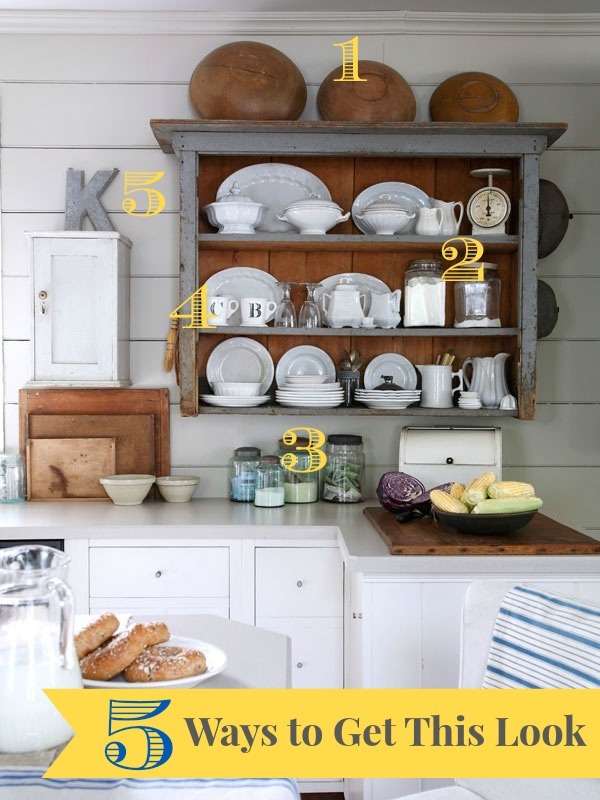 I spotted this kitchen vignette at Liz Marie Blog. I don’t usually go for a very rustic look, but something about this kitchen made me take a second glance. I think it would be perfect in a little cottage tucked away in the trees near a lake….or on a sandy beach somewhere. It’s a kitchen that says, “Stay a while,” isn’t it? Well, if this is a look that you love, I have good new for you! You don’t have to pay the price of waterfront property to get a kitchen like this one. It’s possible to turn the kitchen you have into one that looks a lot like this. It doesn’t take a big remodel, either–the rustic feel of this kitchen comes from the accessories just as much as it does from the structural elements. This was my last Roadkill Rescue challenge on Indy Style, the local lifestyle show I have been a pat of for the last 18 months. 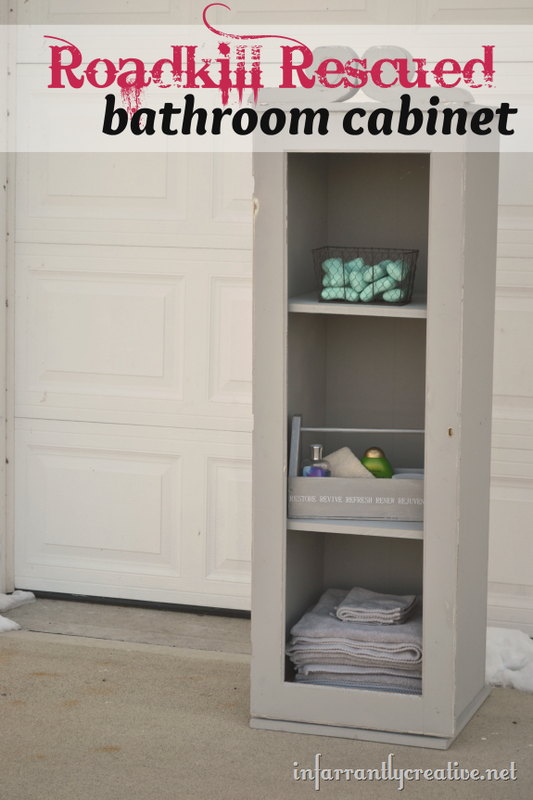 Viewer Jennifer submitted this worn out cabinet/dresser combo she had taking up room in her garage for a year and a half. So I literally took the entire thing apart and pretty much just used the wood to create a standing bathroom cabinet.